This section provides Career Guidance for Engineers to identify right Job Opportunities and for those who wish to pursue higher education courses like MS and Phd. To crack Quantitative Aptitude test we had provided tip, tricks and important concepts to solve problems quickly and easily. As a student, if you are asked to give your career options best suited for you, the answers might be the name of a domain which is closer to your curriculum or a profession which is hot in the job market or higher studies. If the same question is put across to a graduate coming out of the college, the answer will be slightly different. The first option will be job, followed by profession close to your degree and higher studies. What it shows is that career objectives vary from student to student, from freshers to experienced based on the stage of their career, job market, financial background, etc. Bottom line is, are we making our career choices out of compulsion or after doing a proper research on this subject. 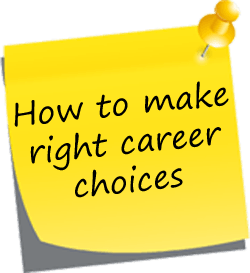 In this article, we will guide you in making right career choices for a better future. At first, one need to assess their aptitude for various fields of work for a better understanding of your talents. You can undergo various Career Personality and Aptitude Test which are available online to test your skills. It is advisable to take these tests after class 10th or 12th to attain career goals. Since long term planning makes your career a great success. If you want a personalized advice and tips on your career options, you can take the help of a career guidance counselor for possible job opportunities. You can also refer various career advice forums to know about latest trends in the job market and expert opinion from career gurus. Once your skills are analyzed, make a list of career options which matches your skills set like the software, commerce, law, etc. For example, if you are good in mathematics you can be an engineer, accountant or mathematician. If you are making decisions after 10th or 12th, choose the appropriate courses which helps you land in a job of your taste. You can choose engineering, commerce or science degree. Try to prioritize each option, so that if your first option didn't work out you can always go to the next option which matches your aptitude. Against each career option, try to map salaries, number of opportunities it generates each year and risk associated with it. Risks associated with a career option are sustained (How long a particular job option last), competition (Number of graduates passing out with a similar skill set every year) and future growth prospects. Analyzing risks at the start helps you withstand economic downturns, job cuts and recession. It also helps you land in high paying jobs throughout your career. For students undergoing higher education courses, it will be good to do skill enhancing courses in your area of study. For example, if you are doing computer science engineering students, it will be good to do Java certification or Microsoft.net certification. If you are pursuing a career in accounting, try to get a part time job as an intern in an accounting firm. These activities will help you garner additional knowledge as well boost your credentials as a pioneer in your field when you submit your resume.